Miss Sadie, the Cowboy and I went to bed early last night. I had been to the polls, and made a good supper, tucking some Italian sausage into the marinara sauce for the spaghetti. The Duo checked to make sure I was sporting an “I voted” sticker when I got back to the Writing Studio and Bait Shop and turned their attention to the interesting sausage. It was a peaceful evening at home. The telephone was blessedly silent at last. We thought about listening to the reporting of the election returns and decided that the facts would be the same no matter when we learned them. Naturally I woke up in the middle of the night as I always do. I turned on the radio just as the concession speech got to the part about congratulating President Obama. Well, I thought, that’s all right then. I was going to go back to bed but I got to thinking about what it means that I feel as I do. I can go to the polls, exchange pleasantries with neighbors who have come to vote for the other guy, cast my ballot, and go home to make spaghetti. In the grand scheme of things, and in the long history of the world, this is something of a miracle. It is good to live in a time of miracles. I’m glad things went the way you wanted. It would be nice if the lobbyists let him do any of things that are needed. That doesn’t mean we have to go to war with each other. I would say that we have demonstrated the limitations of that approach conclusively. Agreed. There needs to be some solution to the problem that for most classes of ordinary working people, wages are static while profits have rocketed. That is not right. I have plugged my landline in again. I believe it’s safe to answer it. Boy that was scary. A nail-biter. If Romney had won I would have just stayed in bed for the next four years. It’s sad that I am so invested in the outcome of another country’s election. There were some miracles. I spent the last four hours of the voting day outside a poling place passing out literature for a neighbor running for the Michigan Supreme Court. Looks like she won. The technique to avoid freezing was to walk constantly. I wonder how many miles of walking I put in. You are a good walker. I’ll bet you were dressed for the conditions and well fortified with a good lunch. Thank you for putting forth the effort. Thank You for casting a vote… it’s a privilege that many in the world do not enjoy and We who enjoy that privilege should never take the responsibility of using it lightly. There were two candidates and one job, someone was always going to miss out. The task was given to the people to decide and they cast their votes…and did. I think it’s human nature to love the system when your person wins and to hate it when your person doesn’t but that’s life and at least none of us live in countries where you have to take your life in your hands and hope you don’t get shot by a sniper when you go to vote. 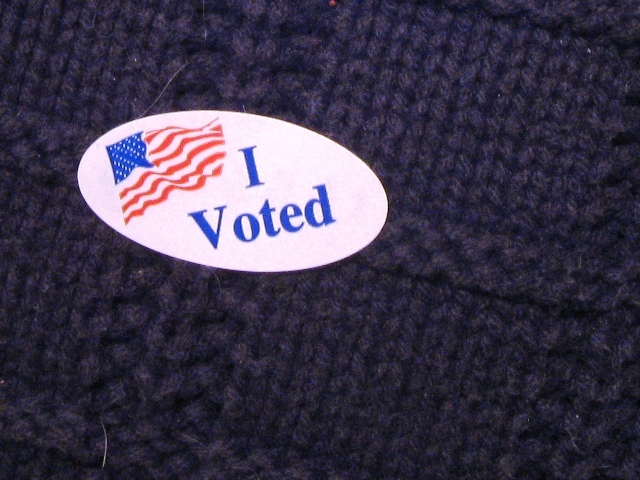 Thank You to EVERYONE who went out and exercised the right to vote. I wish Grace to the candidates and supporters of ALL parties. See, the thing is, I do live in a country where, in my lifetime, people took their lives in their hands to go register to vote, let alone vote. I never, ever, forget that. There were more than two candidates, more than one job, and a whole lot of issues at stake in this election, so it was a fairly complicated matter. From my perspective, I think it went pretty well. The task ahead, as I see it, is to lower the volume and raise the level of discourse. There are a great many people who would like to talk quietly together about how to make things work better. We’ve been thinking of you… We are both pleased and relieved by the result. Thank you very much for your good wishes. I am pretty pleased myself, and feel a certain lightness of spirit, tempered by weary certainty of Interesting Times to Come. But we are intrepid. I suppose it all depends on who’s doing the voting, and on how they see the campaign. We’ve had a long period of very close elections and partisan stalemate in the Congress. Maybe the question we should all be asking ourselves is not how a party can win but how we the people can govern ourselves in peace. Agree with all you said. Can you please run for a public office? Maybe we could get something done. Nope. I lack the temperament. I confess to being chuffed that President Obama won, mainly because the other chappy reminded me of our own , much loathed Tories! I like to believe that elections serve as a reminder to politicians of all shades that, actually, guys and gals, YOU work for US, not the other way around. I suspect that the present political environment gives officeholders the illusion that they are wiser than the rest of us, which is almost never true, and that lobbyists come to them as petitioners rather than as, well, bosses. Not that every officeholder is in thrall to every lobbyist, but I feel pretty strongly that they cannot hear their constituents past the clamor in the lobby. Ah well. We stagger onward, rejoicing. I think there’s a good place for term limits, and for breaking the trend for the eternal innertia and entrenchment of power that makes senators into aristocrats. Stabenow had two terms, that should be enough. When its all said and done, she will have made millions off her public “service” (no different from similar Republican senators, I will add). Makes one wonder, who serves whom? Back to her personally, she has reported a net worth of $0 all the while she rakes in hundreds of thousands from Senatorial over-pay and perks). This type of fraudulent reporting to the public should not stand. but they lie to the public all the time. Well, we’ve already established that we have very different political convictions. Yet here we are, still talking to each other – which makes me optimistic about the future of our country. I won’t debate “facts not in evidence” with you, but I believe that the best way for people to limit a politician’s time in office is to get up off their duffs and find another candidate to vote for. What we do about limiting a lobbyist’s time in all the politicians’ offices, and the ludicrous amounts of money poured into the swill that filled the atmosphere over the last year – that I do not know yet. But I’ll bet that it’s a valuable thing to do, and I’ll bet you and I and a great many other people can make common cause around that particular effort. If all of us were a good deal more skeptical and less credulous we might end up being a lot less cynical and more determined to get to the bottom of things. It’s a tremendous amount of work, but at least it’s work worth doing. And it’s always worth hearing what you have to say, d. I’m glad you drop by now and then. I’m not sure what you meant by “facts not in evidence”, but it didn’t seem to apply to what I was presenting. One problem term limits prevents is candidates who abuse the power of their office to campaign for re-election, and those who shirk their duties of oath as they do so. This point was underlined very strongly to me when Sen. Joe Lieberman announced that he wasn’t going to run again. He said he would serve his constituents a lot better because he wouldn’t be taking time out to campaign. Of course, a reform to stop this would mean a term limit of just one. Something I am not sure about. But imagine if President Obama had been elected in 2008 to a single six-year term. He would have been more able to do his job during this last year, I think. As would any President elected to a six-year term. I don’t have any problem with the money. Once you step back, you can see that the money spent on these campaigns is much less than other small sectors of the economy. Less than videogames. Less than cosmetics. Less than pet food. I’m not into censorship, especially of those who criticize the people in power, and as long as the contributions are voluntary (and they aren’t always).. But one reform I would like would be to criminalize the robo-calls; treat it just like other telemarketers. That’s about stopping harassment, not free speech;. Thanks for the gracious comment. I followed your link and read the WOOD-TV story. You’ve given me some homework to do, and I’ll do it – but not until later today. Duties call. I’m glad we agree about the robo-calls. Back later. P.S. You’re welcome. Back atcha. Yeah, I just can’t see how someone like Sen. Stabenow can have a negative net worth, when she has received around two million in cash from the government over 12 years, not to mention the massive other perks Senators get which mean a lot less need to spend what she gets in. And not to mention the piles of cash she raked in being a “public servant” prior to being a US Senator. A very interesting discussion here. I – many of us over the pond – are relieved too. Nothing is more true (or truer ?) and more needed. Thank you, Isa. I am still doing homework on the dmarks comments, but I am happy that the two of us (very, very different in our perspectives) can find common ground here and there. I think that talking quietly together is just about the only way that anyone in this whole wide world is going to move things away from terror and turmoil and toward true reconciliation and progress. I would say “more true” but you may say it any way you like!